Royal Caribbean's Mariner of the Seas spread some early holiday cheer by welcoming onboard a group of seniors and volunteers of the local voluntary welfare organisation Lions Befrienders for a Christmas tour, show and lunch. The 60 seniors were treated to an ice show, as well as lunch in the Main Dining Room. They also enjoyed viewing the Christmas decorations onboard and had a photo-taking session with the giant Christmas tree along the Royal Promenade. 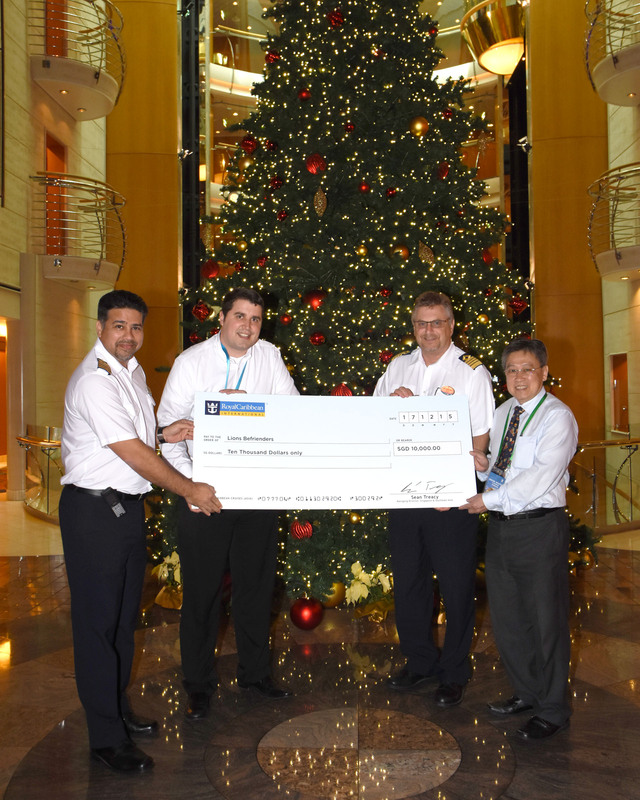 Captain Mal Bardsnes of Mariner of the Seas with Mr Sean Treacy, Managing Director, Singapore & Southeast Asia of Royal Caribbean Cruises Ltd., also presented a donation check of S$10,000 on behalf of the company to Dr Chey Chor Khoon, Executive Director of Lions Befrienders, to contribute to Lions Befrienders’ seniors' welfare and more eldercare services and facilities. This activity is part of Royal Caribbean’s yearly Christmas charity activity in Singapore which invites onboard local charity groups, ranging from seniors to children with special needs or from low income families.